Solanum ferox or acid aubergine plants is one type of vegetable used as flavoring in food. Solanum ferox contains terpenoids, steroids, flavonoids, alkaloids and phenolics. Solanum ferox has antipyretic, antirheumatic, anti-asthma, antiviral and as a drug for syphilis. The purpose of this study is to test the antibacterial activity of leaf methanol extract of Solanum ferox plant. Leaf Solanum ferox is extracted using methanol. Methanol extract was tested for antibacterial activity using diffusion method to use E.coli, S.aureus and B.subtilis bacteria. Amoxicillin is used as a positive standard while negative controls are solvents used to dissolve samples. Antibacterial activity of methanol and amoxicillin extract showed inhibitory zones of E.coli of 7,72-11,67 mm and 19.97 mm, inhibitory zone to bacterium B.subtilis only at 5.7 μg/mL concentration of 11,29 mm and amoxicillin 18, 51 mm. HAZIMAH, - et al. AKTIVITAS ANTIBAKTERIA EKSTRAK METANOL DAUN TANAMAN Solanum ferox L. JURNAL REKAYASA SISTEM INDUSTRI, [S.l. ], v. 4, n. 1, p. 6-10, nov. 2018. ISSN 2621-1262. Available at: <http://ejournal.upbatam.ac.id/index.php/rsi/article/view/693>. Date accessed: 26 apr. 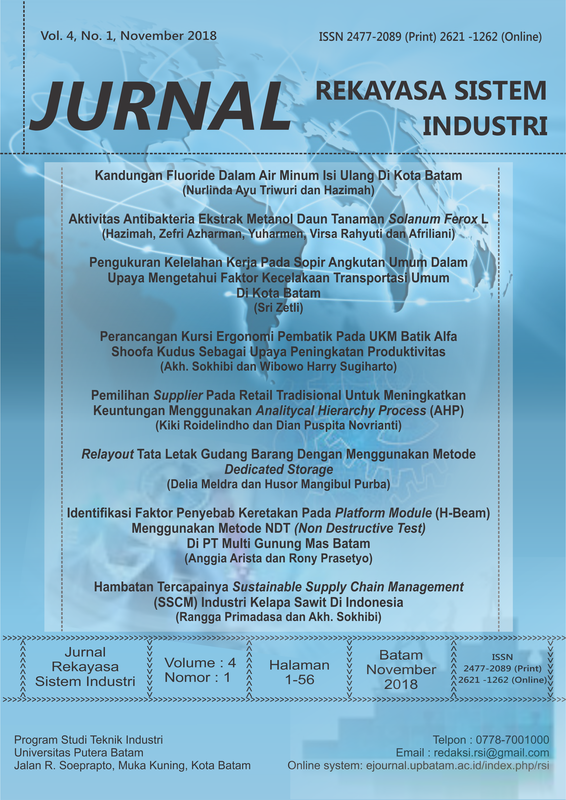 2019. doi: https://doi.org/10.33884/jrsi.v4i1.693.